As you'll see if you delve through my myriad drawings on this blog, for nearly two years in the early 1980s I was based in Kimberley during military conscription. 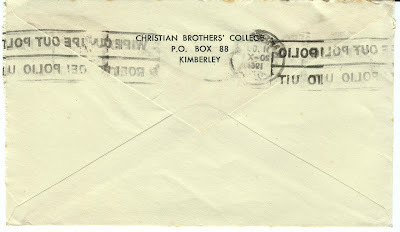 I felt a bit like the stamp on this envelope at the time. The life of most young white males was in turmoil as we were faced with long periods of enforced military service. So this was posted from Kimberley to Port Elizabeth's city treasurer on October 20, 1961 at 11am. But by whom? 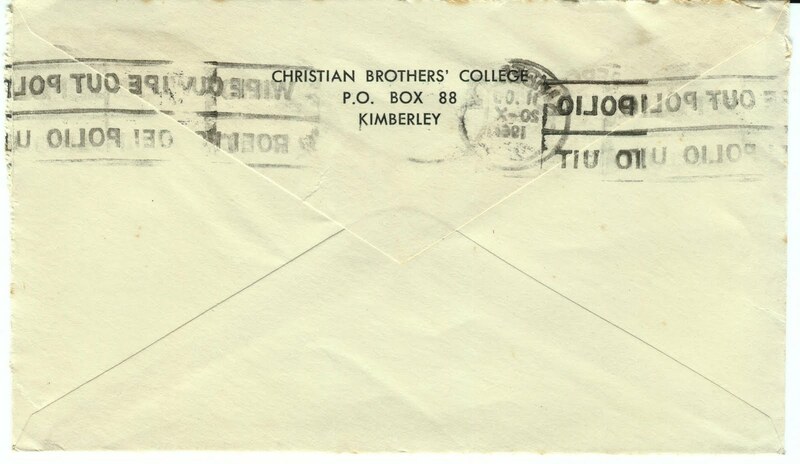 The answer is on the back: Christian Brothers' College. 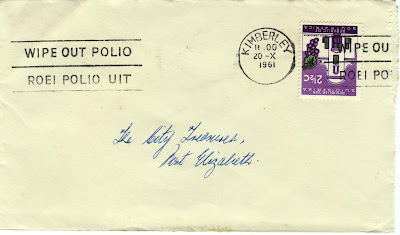 These were Catholic high schools dotted all around South Africa and, judging by a google search, the world. It also seems to have been called St Patrick's College, but I was unable to find a decent website with details such as when it was founded. 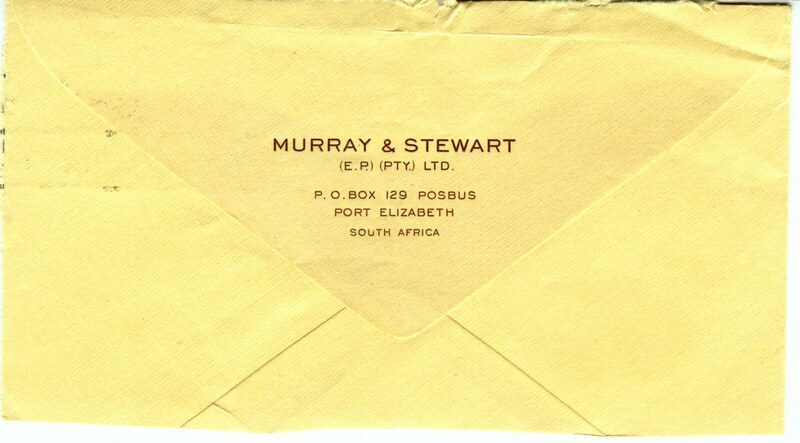 One of the major SA firms, Murray & Stewart construction sites were ubiquitous when I was growing up. Then, I think, they became Murray & Roberts. But in the PE phone book there is only an M&R Aluminium Castings in Struandale. Wikipedia says the company is SA's leading engineering, contracting and construction services company. 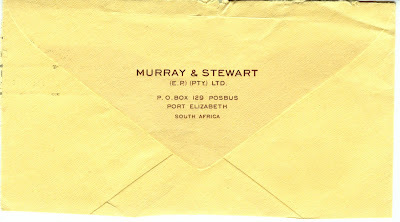 It was formed in 1902, but there is no reference to the Stewart phase. Nor is there any history on the M&R homepage. 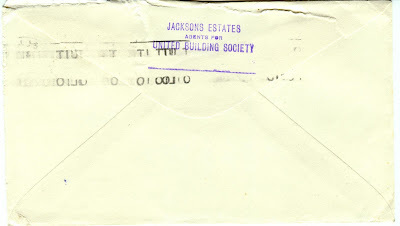 Jackson's Estates are not in the phone book. 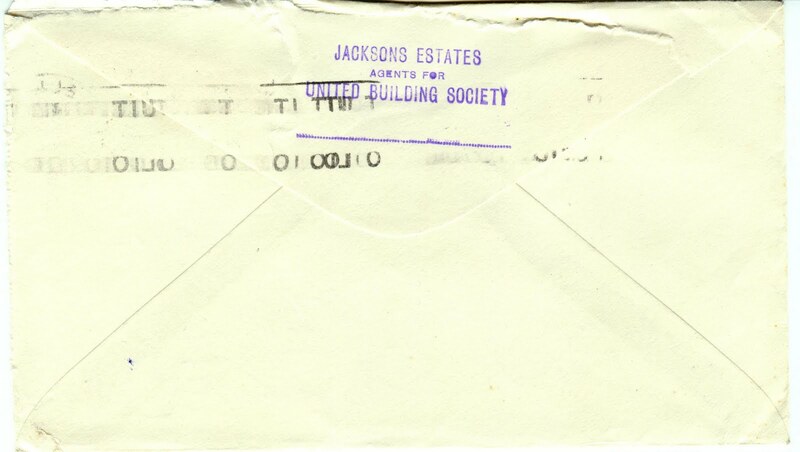 Here they were agents for the United Building Society. Now I recall them, together with the Allied Building Society, Trust Bank and, I think, Volkskas, merging a few decades ago to become Absa - Amalgamated Banks of SA. Ja, the merger started in 1991, according to Wikipedia. But I couldn't find a history of the UBS.